RailsInstaller includes Rails, Ruby, Git and SQLite. Go to http://railsinstaller.org/en, scroll to the 'Downloads' section, and download the RailsInstaller for Windows/Ruby 2.3. Click on the downloaded file to run the install wizard. Click Next at each step to accept the defaults. At the end of the installer there will be a checkbox asking 'Configure git and ssh when installation has completed'. Leave this box checked. It will open a terminal window that you need to type into. Use the same email address for heroku, git, github, and ssh. After this step you will have some git config settings and you will also have an ssh key. The version of Git that comes with RailsInstaller is old, so we will be updating that next. Go to http://git-scm.com and download the installer. You want version 1.9.5 or newer. Run the installer, and it will ask you where you want to install it. 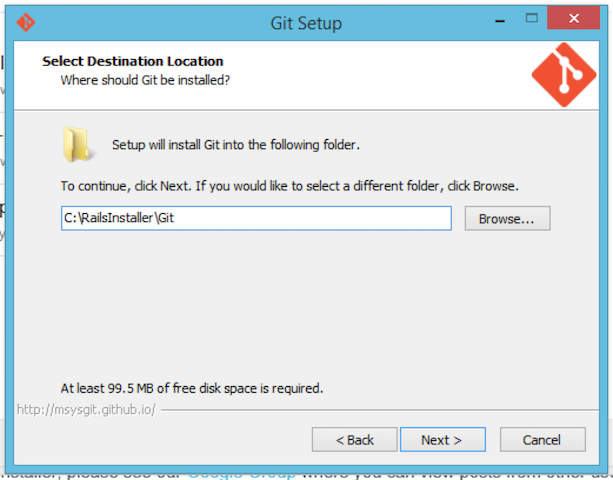 Change it FROM C:\Program Files\Git TO, C:\RailsInstaller\Git like the picture below. It will warn you that the directory already exists. Click yes to install to that folder anyway. Keep going using the default selections and you'll have the latest version of Git installed! Much of using Rails is typing commands and hitting [enter]. Your experience using Rails on Windows greatly depends on your making friends with the terminal window. Normally you will work in a terminal window and keep it open along with your browser. RailsInstaller made a special Terminal for you to use when you're working on Ruby, Rails, or Git. 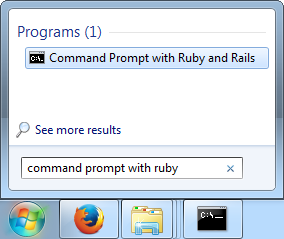 To open the special Terminal, search for Command Prompt with Ruby and Rails. 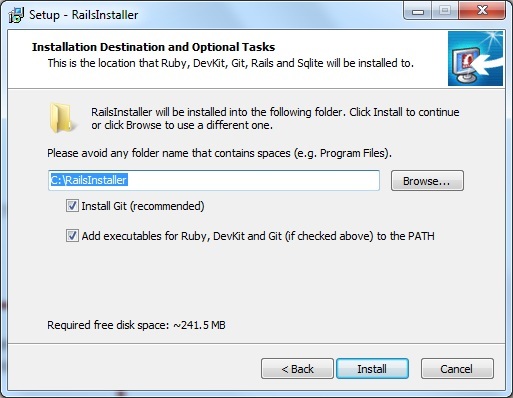 You should do all your Rails work in this RailsInstaller DOS window. Pinning the Command Prompt to the taskbar is a handy shortcut. 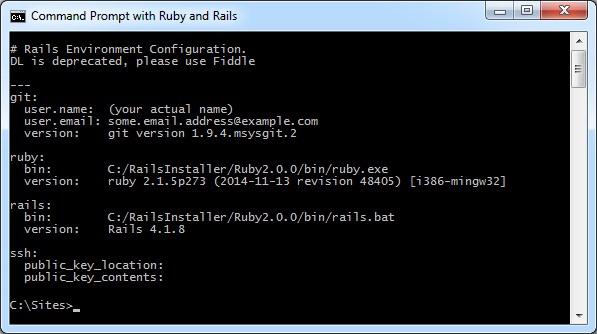 The version of RubyGems that comes with RailsInstaller may be outdated. Follow these steps to upgrade it! If the output is 2.6.7 or later, skip to the next step! As long as the version is at least 2.6.7, you should be fine! Go to http://nodejs.org and download the installer. Pick the one that is "recommended for most users." ...and you're done. New Rails! Woo. 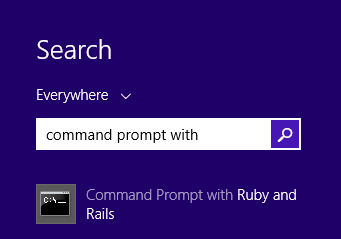 Take a moment to configure the Command Prompt with Ruby and Rails so that it is a good height and width and has a nice font. Under the Font tab, select Lucida Console from the font chooser box. This lets you view non-ascii characters. In the Layout tab, adjust Window Size so the window is about half as wide as your screen, and is as tall as possible without covering the task bar (this may require some trial and error). The terminal window stores a "command history." To view and re-run previous commands, use the <up arrow> and <down arrow> keys. You can also edit a previous command and run it -- this is handy for long commands, or fixing mistakes, or for cycles (series of commands) that you repeat. It's usually better to type commands in yourself. It takes a little longer but you learn more. But if you must... in these instructions, where it says: "Type this in the terminal:", you can usually copy the command from this page, and right click in the menu bar or terminal window, then click on "Paste", then hit the [enter] key. You need a text editor to do Ruby. If you already have a preferred text editor, such as vi, emacs, jedit, etc., you can skip this step. It must be a plain text editor and not something with styling like Microsoft Word or WordPad. Notepad is not a good programming editor, but it will work in a pinch. When in doubt, use Atom. Atom is a good option, if you don't have one yet.